Let see if we have this straight. Steven Samblis, CEO of IC Punch Media states in a post on Investors Hangout that the reason he delayed the launch was because just hours before the launch (and on a Sunday), he sealed a deal to acquire a file library with over 2000+ hours of programming. And that had the deal fell through, he would have launched as planned. WHAT’S WRONG WITH THAT PICTURE ??? So there’s enough programming to launch with 8-shows… but because he sealed the deal for 2000+ more… he has to delay. Help us understand that reasoning. So if 8 shows was enough… why is more a bad thing that would cause a delay??? And while he is unlikely to answer that question, why not throw in a few more he will likely not answer. Why does he talk “shows” when he speaks about the 8-shows… but talks “hours” about the 2000+ in the film library? Seems like apples and oranges. Or, perhaps, smoke and mirrors? And one more… “film library”… where have we heard that before??? Punch maybe ? I wonder if the new library Mr. Samblis just acquired was the old Punch library? We wonder what the PPS would have done today if the launch had taken place as planned, (and announced to the public numerous times), along with the news that in addition to launching ON SCHEDULE… we just acquired another 2000+ hours of programming. I guess we will never know, because Mr. Samblis’s decision to delay caused the stock to fall another 25%. The PPS is the CEO’s report card… and Mr. Samblis just failed the test… and perhaps the course, with the decision to delay the launch. The investors of the company spoke loud and clear today. We suspect there will be more voices heard tomorrow, although with the volume today of 187-million shares, apparently quite a lot voted today already. Just think… if creditability was not an issue with Mr. Samblis… these might be some really cheap prices to buy up some shares. However with not knowing what the next big disappointment will be, and no confidence there will be any indication of a possible disappointment put forth by Mr. Samblis… even buying at these low prices could cost you a lot of money if the PPS continues to fall over this next month. Buyer beware ! Launch delayed… who’s surprised ??? Once again, post after post by Steven Samblis, CEO of IC Punch Media stating the launch was on schedule and that there would be no delays… only to find out (just hours before the launch) that the launch is in fact delayed for over a month (this time till October 29th). There appeared to be some good news in the notification, however the bad news far outweighed any good news. Does anyone think Mr. Samblis just found out he couldn’t make the much publicized launch date tonight??? Its decisions like this that cause many to question Mr. Samblis’s creditability. Can investors depend on Mr. Samblis to tell you the truth? It appears not ! So… Mr. Samblis has insisted many times, just as he did about the launch date being on schedule, that there would be no Reverse Split. Is that the next bombshell to drop??? 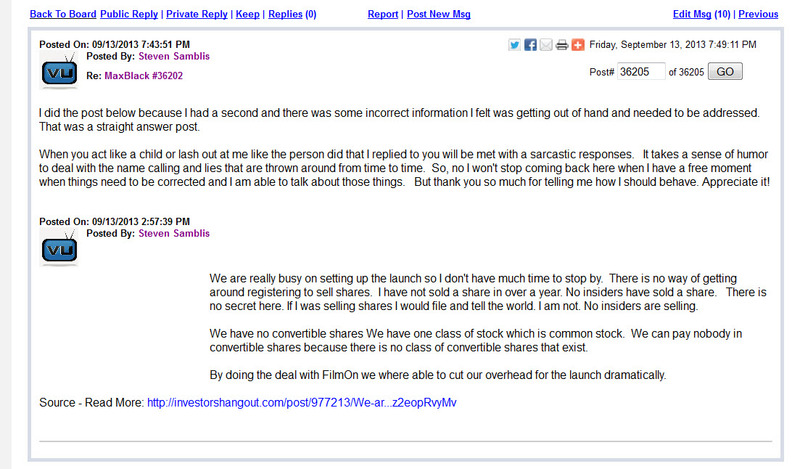 If Mr. Samblis misled investors on the launch… can he be trusted on the Reverse Split statements??? When people take off the rose colored blinders, they can see that actions like this is why the PPS is circling the drain. That is unlikely to change until the actions of this CEO change. The reason given for the delay is so that more programs can be added to the roster. Can Mr. Samblis be trusted to think that is the real reason? 4 more days to go. Yes folks… only 4-more days to go before the “World Launch” of VU Television Network. Stock was up 28% today on a little less than normal average daily volume. And at one point during the day the PPS actually got out of the tipple zero’s. Funny how many are getting excited to get back to .001. It would be like gas getting back to say 2.99 a gallon. Everyone would be so happy, but you know in reality 2.99 is still a lousy price. The BIG question is… what is Steven Samblis, CEO of IC Punch Media going to do before the launch??? 4-days before the launch and no one has seen a broadcast schedule, slate of shows other than the few that were announced over a month ago, who the advertisers are, revenue projections, where the content can been seen other than FilmOn, etc, etc, etc. Either there will have to be a 10-page Press Release on the 22nd., or, we have seen all we are going to see until AFTER the launch. The business plan so far has been to not release anything for fear the bashers will do something to derail the plan. Well… if the relationships have not been solidified by now, investors are in for some more pain. And what about fear that even after the launch, the bashers will attempt to derail the plan? Maybe Mr. Samblis should never release the plan… that way the bashers could not derail something no one knows about… even the viewing public. Sounds crazy we know, but so does the plan to have not released anything even this close to the launch date. Well… the remaining investors have waited this long, and tolerated Mr. Samblis’s actions (and non-actions) for this long, what’s 4 more days. Now, what will happen to the PPS 5-days from now??? That’s the big question. Answer… likely nothing. Why… because of all the shenanigans that have transpired up to this point. There are still too many unanswered questions that will likely remain unanswered LONG after the launch, and are likely to go unanswered forever. If the PPS withers and dies, there is no need to answer the questions… and if the PPS goes sky-hi, there will be no reason to answer the questions. Does anyone really think that there are any potential investors that have not seen the numerous problems with PNCH? Are there any investors out there that will think Steve Samblis is CEO of the year once they spend more than 5-minutes doing some DD on PNCH history? And finally, does anyone think the bashers will not be hammering away after the launch about PNCH and its CEO Steven Samblis? As much as any remaining investors wish the best for PNCH… the past will always be nearby to bring concern to any potential new investor. The only thing that can blind most investors is money ! If PNCH can demonstrate it can produce tons on cash for investors, investors will invest and disregard all the red flags that they would normally be fearful of. However, it will likely be a year or more before that kind of cash starts rolling in… if ever. So… as much as current investors wish it, all current indicators point to Launch day likely being lack luster at best, and not doing too much for the PPS. We hope we’re wrong, but the handwriting is on the wall. STOP with the misleading statements ! The stock is at its worst levels it has seen in possibly its history, and Mr. Steven Samblis, CEO of IC Punch Media, Inc. still plays games with words in order to mislead investors. PLEASE Mr. Samblis… investors have had enough of you cherry picking which softball questions you chose to answer, and being reckless with the truth when you do. In a post tonight, illustrated below, MR. Samblis responds to a poster’s request to stop the nonsense and answer straightforward (very important) questions being asked of him. His response, as can be seen below, and at the link here, if it stays posted, is to lash out at the poster disrespectfully. Since the release of the newest PR, the PPS has fallen another 25%. Investors have asked some very straightforward questions like… who is president of the company, or how is Mr. Samblis paying for the day-to-day operations of the company. As can be seen, Mr. Samblis’s response scolds the poster by saying he will not stop posting on the board in order to correct things, like the share structure that was originally in question in one of today’s earlier posts. Mr. Samblis is quick to reply using the same phraseology as he has used many times before. However, Mr. Samblis’s canned response does not address the root of the dilution question. Notice in ALL his responses regarding dilution, he never addresses how he is paying for the day-to-day operations. He never addresses what (or WHO) is responsible for the ever increasing outstanding share count (although its obvious who is responsible). He states “he” has not sold a single share, So… how is he financing the daily costs of running the company? He may not be selling his “personal” shares… but that was not the question… the question is how are you financing the daily operations. Don’t tell us how you are NOT doing it… tell us how you ARE doing it. Everyone knows he is selling shares to operate the company, and it infuriates them to be taken for fools when he states he has not sold any of his personal shares in over a year. Mr. Samblis hides behind the “basher” excuse, or he hides behind the “in due time” excuse in order to not address some of these very basic, (but very important), questions about the basic operations of the company. This is inexcusable ! There is NO reason these questions can not be answered, unless the news is so bad it will cause the few remaining investors to flee also, as the rest have already done. Mr. Samblis likes to blame everyone but the man he sees in the mirror every morning. This company’s future is bleak unless Mr. Samblis changes his ways… and that appears unlikely to happen if it hasn’t happened already. As they say… a leopard never changes its spots. Yup… that was the quote from Steven Samblis, CEO of IC Punch Media when asked why he had not released any information about the launch so close to the launch date. Its been over 2-weeks since we posted comments about that situation… and nothing has changed. Oh wait, yes there have been changes… the PPS is now lower, closing today at .0010, after recovering somewhat from a daily low of .0008, where there was a 25.6 million share transaction. Well… in less than 3-weeks investors will see if they have all been scammed, or his silence was the smartest move in modern times. Silence from Steven Samblis at a time like this takes huge brass ones. Friends wonders how this will turn out. Samblis should get CEO of the year if he can pull this off. He will either be a hero… or a zero in about 3-weeks time ! Not much else to say at this point… it has all been said. Its a waiting game at this point. Investors that have hung in there from the mufti-penney range (i.e. trapped) are holding their breath and hoping for a miracle. The bashers are laughing because it appears Mr. Samblis has played right into their hands by not releasing updates on the progress and plans, for fear the bashers would derail those plans. However as it turns out they didn’t need to lift a finger in their effort to drive down the PPS, because the very thing Samblis tried to avoid, played a significant role in the ongoing destruction of the PPS. The silence kept the PPS falling, and Samblis kept silent because of the bashers. Brilliant work by the bashers… a tactic that will likely be revisited on other vulnerable companies. So folks… stay tuned. This is either going to be a rocket headed for the moon… or a lead weight that falls to the ocean floor. If you have already purchased your tickets for the ride… hang on, and good luck. We should know something by the 23rd. of this month. We have waited this long, what’s a few more days. Enjoy the show !